If you’re selling a home, do you wonder which generation has the most active buyers today? The answer may lie in the most popular names of current homebuyers. A new report shows that buyers with first names popular among Millennials had the biggest increases in home purchases in 2017. This isn’t an exact science, of course. But it highlights an important point. Gen Y is claiming more homes today than older buyers. Their stories and reasons for buying are as unique as the names their parents gave them. Whether you’re a Millennial, Gen-Xer or Boomer home seller, pay attention to demographics. Be mindful of what interests buyers from different age groups. A fresh study by ATTOM Data Solutions probed over 4 million sales of single-family homes last year. Its goal was to learn how active each generation was at buying homes. The age groups included Millennials (born 1980-1994), Gen X (1965-1979), Baby Boomers (1946-1964), Silents (1925-1945), and the Greatest Generation (1910-1924). The largest increases in homes bought were by buyers with popular Millennial first names. These included Dylan (41% increase), Chelsea (+17%), Austin (+16%), Alexandra (+14%) and Taylor (+13%). These names were most popular 1992 and 1995. The largest decreases were by purchasers with first names favored among Gen Xers, Silents, and the Greatest Generation. These included Gerald (down 17%), Kristin (-18%), Stanley (-17%), Kurt (-16%), and Jaime (-16%). These names were most in vogue between 1916 and 1976. Trends varied from state to state. Daren Blomquist, senior vice president for ATTOM Data Solutions, says this study has relevance beyond laughs. In 2017, Millennials were the largest group of home buyers—34 percent—for the fourth consecutive year. The Census homeownership rate by age range indicates the under-35 age homeownership rate has steadily trended higher. It bottomed out at 34.1 percent in the second quarter of 2016. But it rose to 35.6 percent in the third quarter of 2017, the latest data available. That same Census data shows that the homeownership rate for ages 45 to 54 is continuing to drop. It hit a new all-time low in the third quarter of 2017. Here’s a way to put this data to work for you as a buyer: Obtain a list of homeowner names in neighborhoods you like. “Look for older generational names. 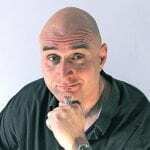 Then, send them postcards or knock on their doors to see if they are interested in selling,” suggests Blomquist. What’s the best source of money if you’re over 62? Home equity loan of reverse mortgage? Third, older folks are not becoming move-up buyers in great numbers. Blomquist finds this data intriguing. Blomquist says his team didn’t have buyer names in mind when they first parsed the records. Moniker patterns began jumping off the page with closer looks. 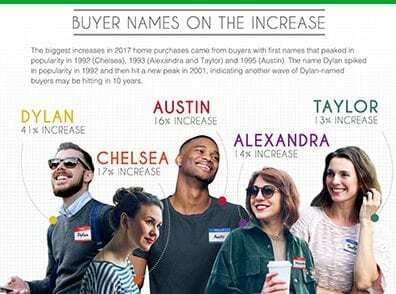 “What stood out was the prevalence of popular millennial names among the top buyer names that saw the biggest increase in home purchases in 2017 versus 2016,” he says. Another surprising finding? “The top five names spiked dramatically in popularity within a very narrow time period—1992 to 1995. This tells me that it’s not all millennials who are accelerating their home buying activity. It’s specifically those between ages 22 and 25 in 2017,” he says. Blomquist notes that this study isn’t the last or only word on the subject. Also, “these Millennial names are not even close to the names that bought the most homes in 2017,” he says. All of these names saw declines in home purchases. Yet, if you want to better ensure that your future child owns a home, don’t give up on these time-tested names.